Saxophonist Tim Garland has brought together a quartet of excellent musicians for his new CD, which he sees as unifying different strands of his musical development from his early days playing jazz-rock. He has worked with keyboard maestro Jason Rebello many times before, and percussionist Asaf Sirkis is a regular collaborator. Guitarist Ant Law completes the quartet. They are joined by Dionne Bennett on vocals for Pity the Poor Arms Dealer, and Hossam Ramzy contributes additional percussion on three tracks. With Sirkis, Ramzy and Garland himself playing percussion on some tunes, this is a percussion-rich record, but it is not drum-heavy. The lightness of Sirkis' drumming and Ramzy's various middle eastern percussion is clear from the opening number, Sama'i for Peace, a fast, highly rhythmic number, Garland's soprano saxophone adding to the Mediterranean feel. Colours Of Night, also featuring Hamzy, has a similar mood, Law providing a slow but intense solo over a bass line from Rebello's keyboard. Other pieces are infused with Latin rhythms, reflecting the influence on Garland's writing of Chick Corea, with whom he has played extensively. For all the rhythmic complexity, Garland's sax and Law's guitar playing produce a depth of melody and harmony. Bright New Year, for instance, is light and optimistic, Garland's soprano line rises like a lyrical birdsong; Rebello's understated piano solo is also a joy. The Gathering Dark is similarly lyrical, and not at all dark. In contrast, Prototype starts as a piece of classic jazz-rock, Sirkis laying down a heavy beat; the track develops into something more subtle with Garland's tenor solo. Sirkis clearly enjoys the opportunity to let rip in the faster sections. 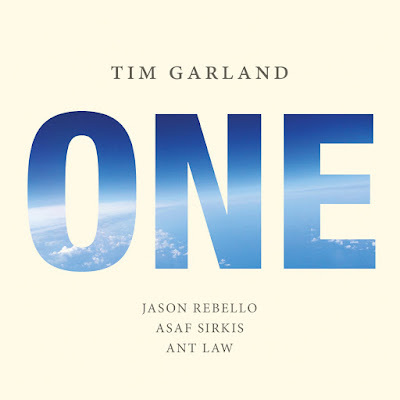 With such a wealth of influences, it would be possible to create a record of disparate pieces, but as befits a record called One, they have a unified tone, brought together as new whole by Garland and his band.